The inlaid red roses on the almost white maple wood is a beautiful way to express everlasting love in this Roses on Maple Wood Cremation Urn. The octagon-shaped urn is easily accessed through a bottom plate. 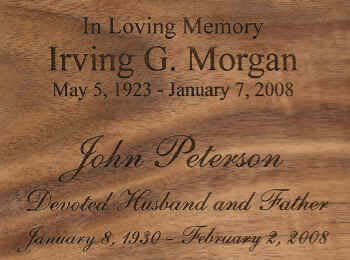 Engraving of name, dates, and short sentiment is available for an additional fee. Engraved text will be on the top of the urn as there is not enough room on the front of the urn with the inlaid roses. Please limit engraving to no more than 35 spaces per line. Check engraving information to be sure spelling, punctuation, capitalization, and dates are correct. Engraving will be done exactly as submitted. Urn usually ships in 3-5 business days, even for expedited orders. Ships from the West Coast.